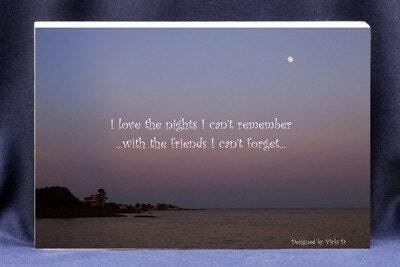 Funny Friendship gift plaque - I Love the Nights I Can't Remember with the Friends I Can't Forget! Photo of "Super Moon Over The Bay 2015" funny gift plaque! Designed and created by Vicki D. and sold exclusively by Absolute Inspirations. Purchase one for your home or office today or send one to someone special just for fun or to celebrate a special occasion. Better than a greeting card and the gift that keeps on giving! We are happy to add a special note card to accompany your gift. Simply click on the request a custom order link and let us know how you would like your note to read. We also ask that you please leave a good contact number in case we need to reach you!